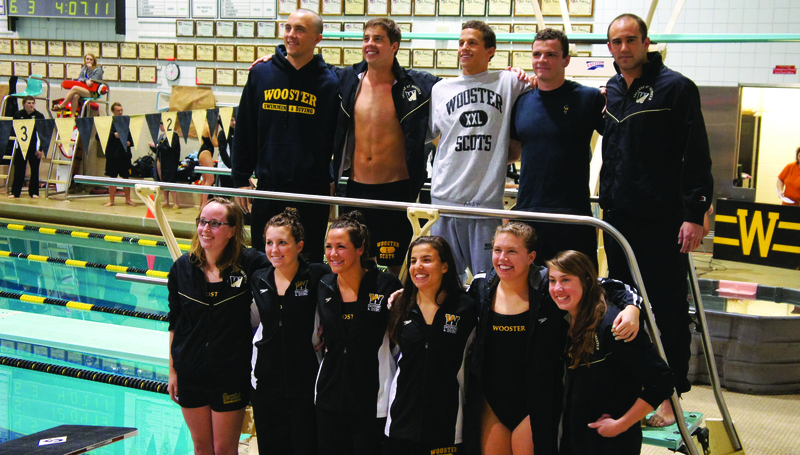 The College of Wooster men’s and women’s swimming and diving teams have gone undefeated this month, boosting both of their dual-meet records to 6-3 on the season. Together, they kicked off the New Year on Jan. 12 with a sweep of Ohio Wesleyan University, and went on to defeat the University of Mount Union, Defiance College and Malone University in two blowout meets last weekend. On the road in Alliance, Ohio last Friday, Wooster’s men’s team topped Mount Union 155-139. Pacing the Scots with two individual victories was Peter Parisi ’13, who placed first in the 50 free (21.64) and the 100 butterfly (52.27). He also contributed his speed in the breaststroke leg of the winning 200 medley relay (1:36.86), which included teammates Alex LaJoie ’13, Brian Maddock ’15 and Imre Namath ’13. Namath and Maddock posted individual victories in the 100 free (49.06) and 200 back (1:59.25), respectively, while other winners included Evan Hagedorn ’15 in the 100 breast (1:03.43), Frayne Poeting ’16 in the 200 breast (2:20.35), Zackary Pool ’16 in the 200 fly (2:02.70) and Hawken Lewis ’16 in the one meter diving event (125.85 points). Two double-winners on the women’s side led the way to a 170-114 victory over Mount Union on Friday. Rachel Appleton ’14 swept both breaststroke events (1:12.08; 2:36.99), while Samira El-Adawy ’13 championed the 200 free (2:01.62) and the 400 IM (4:53.18). The 200 medley relay team of Mariah McGovern ’14, Caroline Hanson ’13, El-Adawy ’13 and Morgan Hughes ’15 touched first with a time of 1:53.31, while Hughes, McGovern, Molly Laubernds ’16 and Clare Walsh ’13 won the 200 freestyle relay in 1:42.90. Hughes added an individual win in the 100 fly (1:00.23). The Scots swept both distance events, with Kara Markham ’14 finishing the 500 free in 5:27.26 and Marry Nappi ’13 going 11:24.22 in the 1000 free. Rounding out the women’s individual wins was Lena Smith ’16 in the 200 fly (2:19.48). In a double-dual meet on Saturday, the Scots took on Defiance College and Malone University simultaneously at Wooster’s Timken Natatorium. 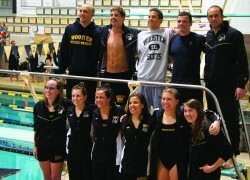 Wooster’s teams combined to win 18 of 32 events and sweep both opponents in one effort. The women’s team once again routed their opponents, with scores of 223-24 versus Defiance, and 198-83 against Malone. The Scots scored big points in three individual event double-winners and two relay victories. El-Adawy touched first in the 100 back (1:03.23) and the 200 IM (2:20.16), while Hughes was champion of both the 200 and 500 freestyle events, with respective times of 2:03.44 and 5:38.21. Hanson swept the breaststroke events, posting times of 1:11.46 in the 100 and 2:36.23 in the 200. The Scots earned first and second place in the 200 medley relay, with the B team of McGovern, Appleton, Hughes, and Laubernds finishing just 0.14 seconds behind the A team of Walsh, Hanson, El-Adawy, and Liv Aspiras ’13. Hughes, McGovern, Laubernds and Walsh easily took first in the 400 freestyle relay with a time of 3:49.68. Touching the wall 10.5 seconds later was Wooster’s B team of Colleen Kill ’15, Caitlin Shea ’15, Markham and Alex Desotelle ’16, who were still fast enough for second place. The men also put big points on the board, defeating Defiance 244-8 and Malone 154-134. LaJoie swept the 100 and 200 yard backstroke events with respective times of 54.87 and 2:04.69. He joined Parisi, Maddock and Namath for a first-place winning 200 medley relay (1:37.21). Other individual winners included Elliot Ferrier ’16 in the 500 free (5:11.32), Maddock in the 1650 free (17:47.27), Namath in the 50 free (21.94) and Parisi in the 100 fly (51.92). The Fighting Scots will compete in their final dual meet of the season tomorrow at Allegheny College at 1 p.m.